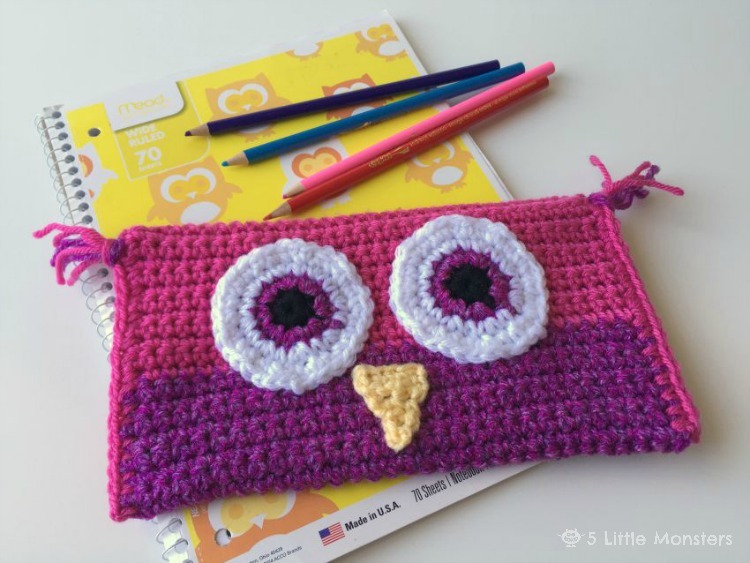 Back in August before school started I shared patterns for several different crocheted pencil bags all based on a basic pencil bag pattern. 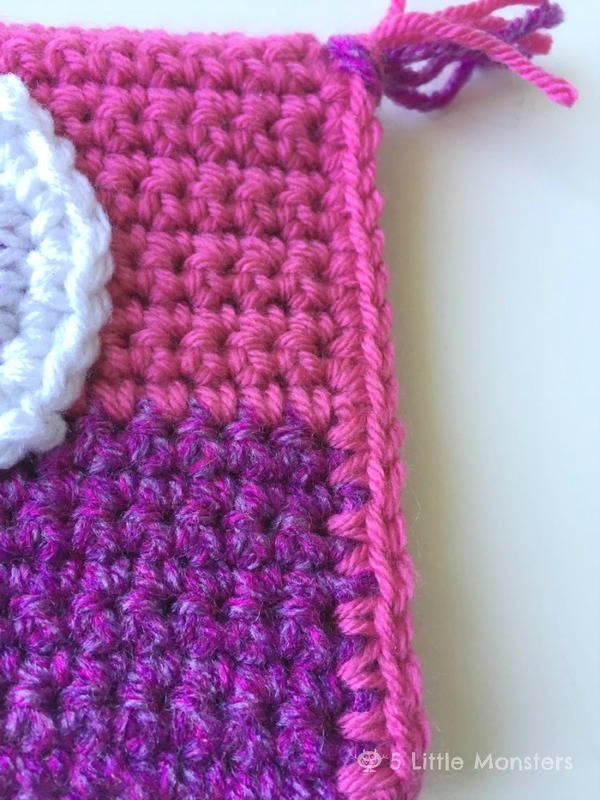 This one I originally shared as a contributor post on Craftaholics Anonymous but I thought it would be good to share it again here. 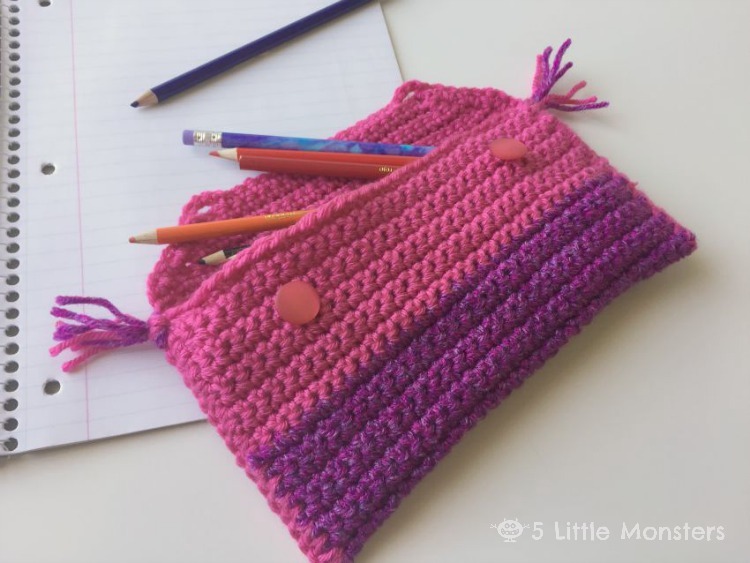 Especially because although I originally made it thinking of back to school time, it would make a fun Christmas gift as well and it is time to start working on those. 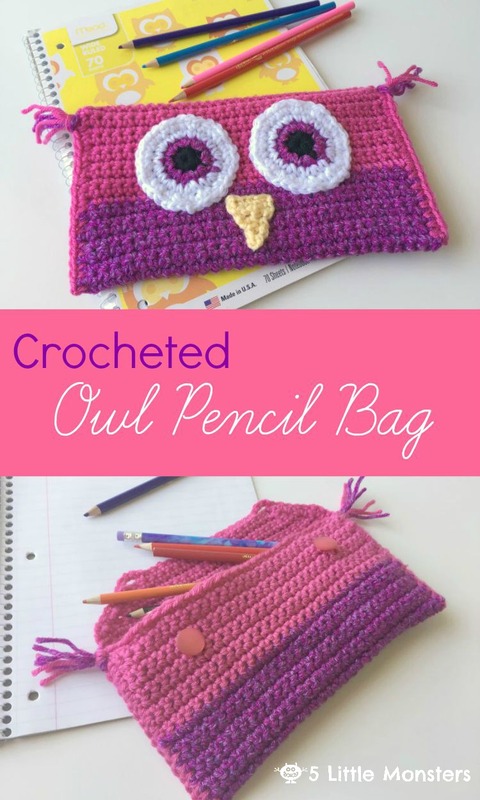 I have made lots of owl hats to give as gifts or to sell and they are always a big hit so when I was trying to come up with pencil bag ideas an owl seemed like an obvious choice. 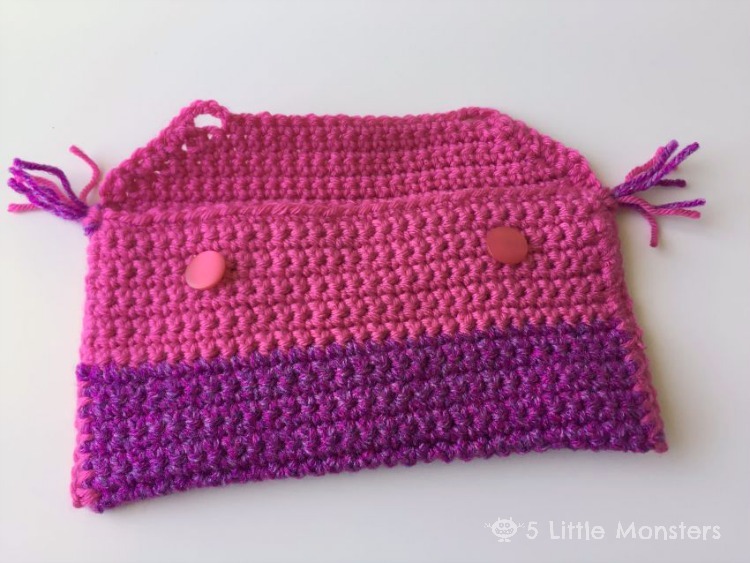 This bag is pretty easy to make, you make it the same way as my basic bag pattern, the only difference being that you change colors in the middle. 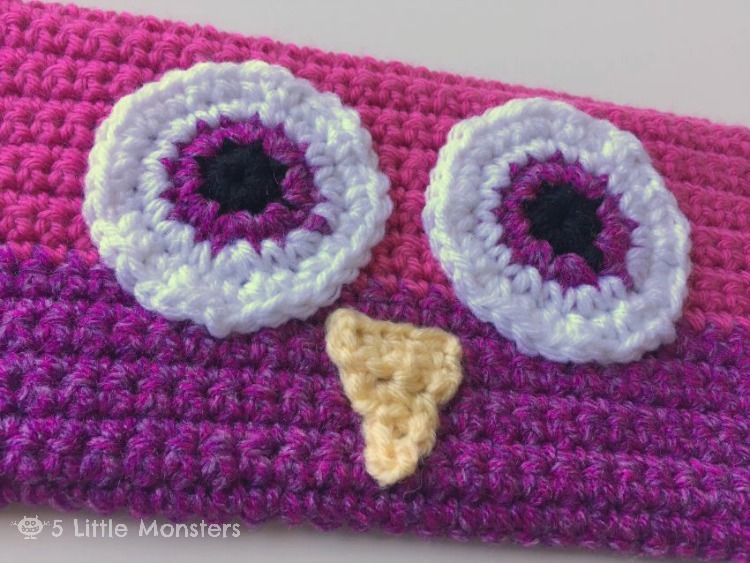 The eyes and beak are crocheted separately and crocheted on afterward. Then the little ear tufts, I don't really know what to call those, are added on as well. Two buttons on the back keep the bag closed. The finished bag measures about 9 x 5 inches. 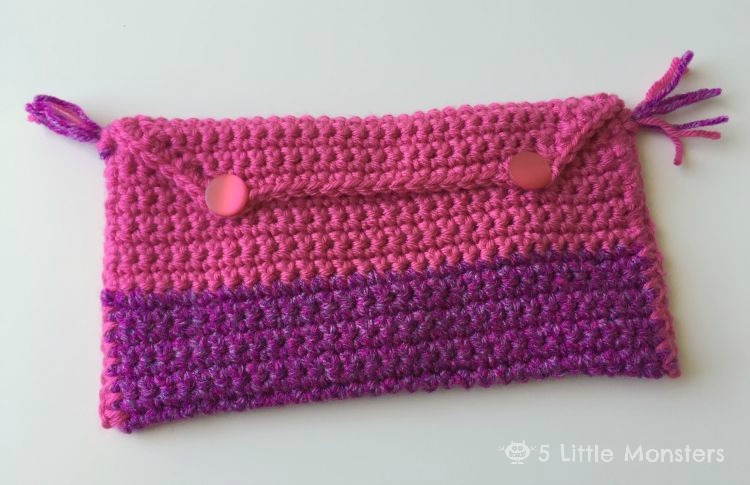 You can use any worsted weight yarn to make these bags. 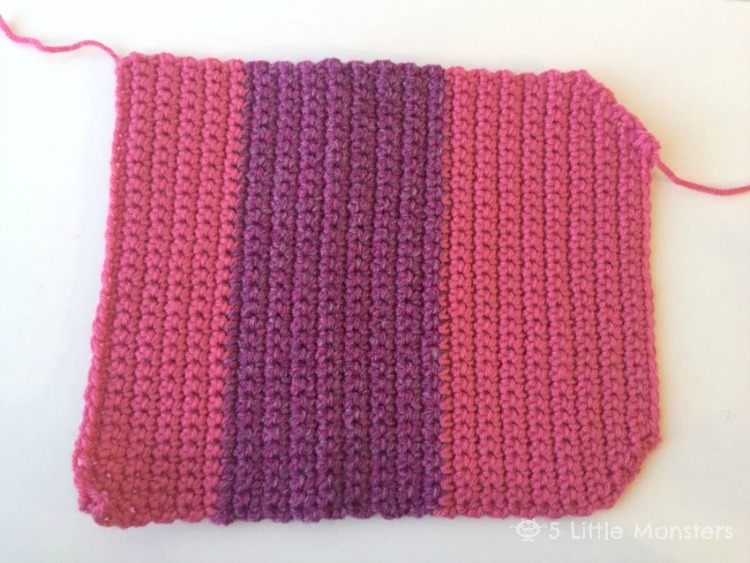 This one is made with Red Heart Super Tweed (the purple section- Pinkberry) and Deborah Norville Everyday (the pink section- Grenadine). 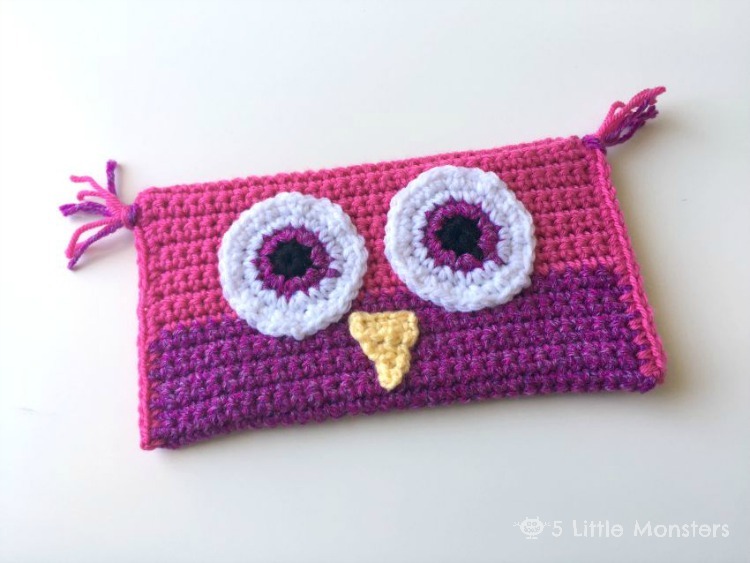 The eyes and beak are made with scraps of leftover yarn. I have also used Red Heart Super Saver and Vanna’s Choie yarns for these bags so anything similar in weight to those will work fine. Fold the bag wrong sides together so that the first 18 rows are on one side and match up with rows 19-36. The pink and purple sections should match up. with yellow yarn, ch 5Row 1: sc in second ch from hook and each ch to the end (4 sc)Row 2: ch 1, turn, sc dec, sc dec (2 sc)Row 3: ch 1 turn, 2 sc (2 sc)Row 4: ch 1 turn, sc dec (1 sc)Row 5: ch 1, turn, sc (1 sc)Finish off leaving long end for sewingSew eyes and beak to front of bag making sure to sew through only one layer. Fold flap down to determine button placement, sew on buttons. I find that it is usually best to use sewing thread and a sewing needle to be able to get through the small holes on the buttons.